LOS ANGELES, California (CNN) -- An 850-pound emerald said to be worth as much as $370 million is in the hands of the Los Angeles County Sheriff's Department while a court decides who really owns it, a spokesman for the sheriff said. This enormous raw emerald was being kept in a Las Vegas, Nevada, warehouse. The "Bahia Emerald" -- one of the largest ever found -- was reported stolen in September from a secured vault in South El Monte in Los Angeles County. The report was made by someone who claimed to own the giant gemstone, Los Angeles Sheriff's Lt. Thomas Grubb said. Federal court papers showed the emerald has been at the center of a dispute between a California man who claimed ownership, a company he contracted with to sell it, and a potential buyer. Detective work traced the Brazilian stone to a Las Vegas, Nevada, warehouse, where the person in possession claimed to be the rightful owner, Grubb said. 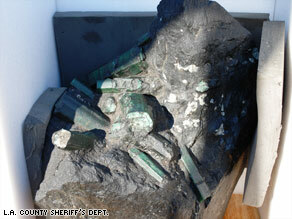 A federal judge ordered the sheriff to hold the 180,000-carat emerald until he can sort the case out, Grubb said. Investigators suspect someone used falsified papers to remove the stone from the secured vault in California, although no criminal charges have been filed, Grubb said. While Grubb said it was his understanding the stone had been appraised at $370 million, the value is unclear. The company hired by the owner to sell it said in court papers it had received a $19 million offer, which the company wanted to accept. It alleged the gemstone's owner then tried to go around the broker to sell the emerald to the same buyer for $75 million. At one point, the emerald was listed for sale on eBay for a "buy it now" price of $75 million.